The chart below from Moody's takes a sober look at the performance of the largest LBO firms. 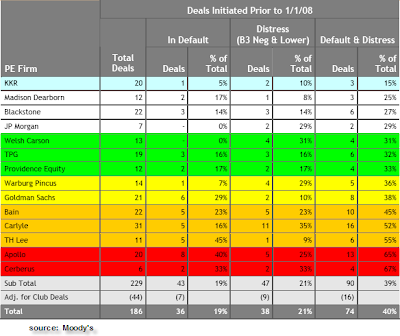 It presents the percentages of LBO deals by sponsor that are either distressed or have defaulted. Cerberus with investments such as Chrysler and IAP Worldwide (IAP provides support services, particularly for the US government/military) seems to have 2/3 of it's LBO deals go bad. Apollo (with deals like Hexion, Berry Plastics, Linens 'N Things, and Harrah's) is not too far behind. KKR on the other hand has done quite well. The group of sponsors as a whole is at 40% (distressed and defaulted). Got to love all that leverage. Moody's points out that on average LBO default rates are no higher than other corporations - except for the largest deals. Hence the result.